Hello Minecrafters. Global Warming is upon us. The environment cannot take much more. The Earth's atmosphere will soon be too polluted or destroyed by Nuclear Warfare for human life to live on. We need to seal ourselves out one day. Making a space ship and travelling to The Moon or Mars is too expensive and dangerous for us to do. We need to stay on Earth and somehow cope with these dangerous conditions. An airtight glass dome where the polluted air can't harm us? Sounds like a good plan! Funded by the United States Government, a research experiment known as Project 52 has begun. A small piece of land in a forest in a Minecraft world is a perfect place to begin the research. This place is known as Area 52. Multiple airtight glass domes have been built. Glass domes in the sky have been built. We have test subjects. We need more. 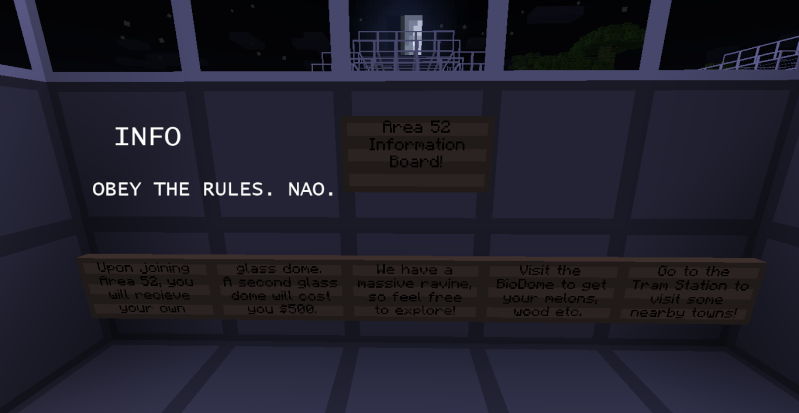 Come live in Area 52 and become a test subject and live in a glass dome to see what it is like to live in a dark future where the air we breath is dangerous to us. 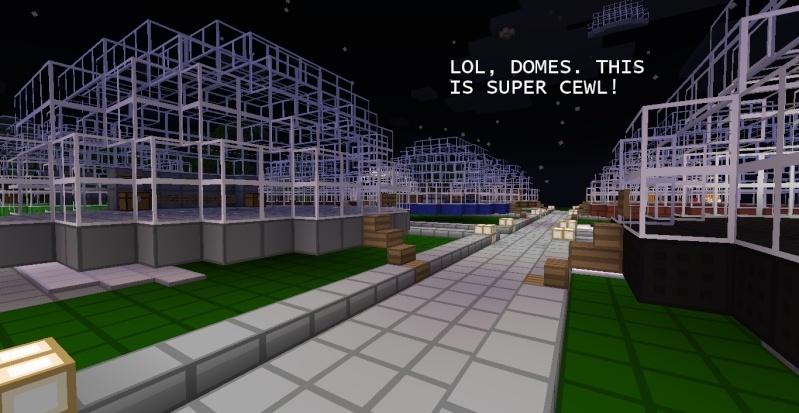 As you can see, the whole town is an assortment of glass domes built to keep it's residents safe. A BioDome. Most of the animals are going to be dead in the future, so we will need another way to survive. Melons. 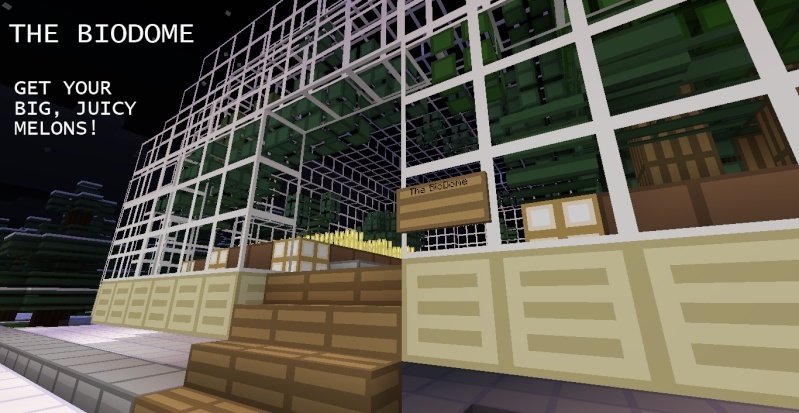 There is a melon and wheat farm in the BioDome, free for residents to use. Since this is Minecraft, we will need to MINE, wont we? We purposely chose a location built above lots of ravines and caves so residents will be free to mine away and explore! 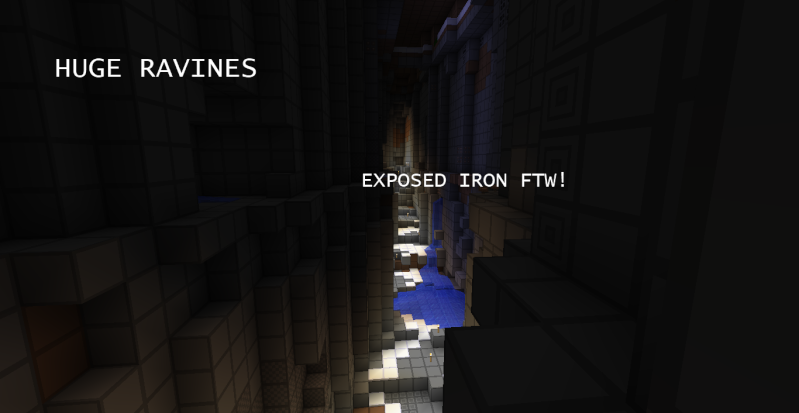 There is a way into the caves and ravines from the Information dome. Every single building in Area 52 is a dome. To keep residents safe of course! Lol but seriously there is no pollution or anything but the dome thing is cool. You will be able to customise your dome as long as it keeps its dome shape and is still recognizable as a dome. A Tram Station. The only tram line we have is a line to SteinHafen (which isn't too far away) But there is space for more tram lines. 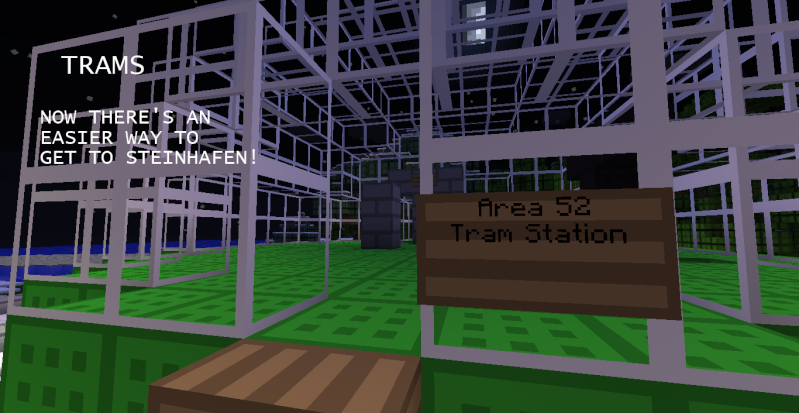 If you would like to build a tram line from your town to Area 52, contact me! Yes, domes in the sky. 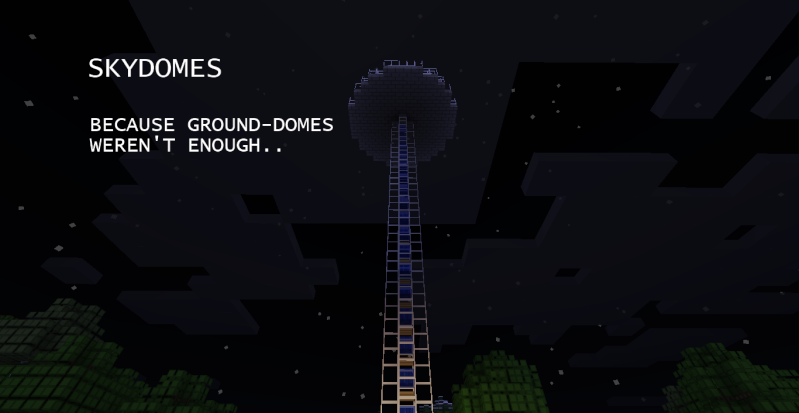 Due to some plot problems, I have decided to make some SkyDomes. So until further notice, you will live in the sky. This is the information board. Make sure you read it when you join. (It is in the stone dome near the BioDome). 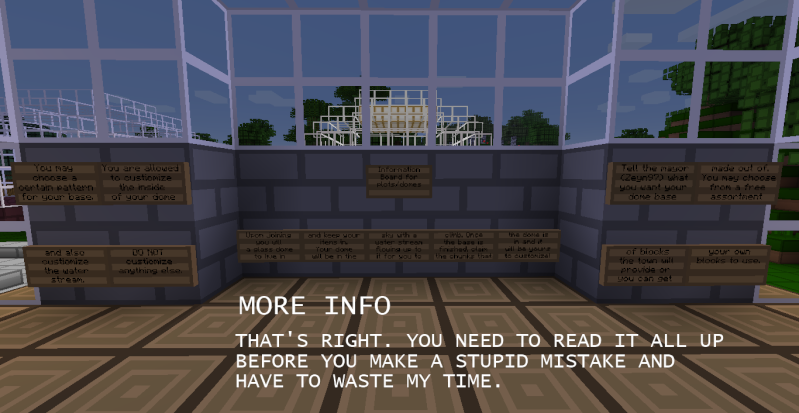 This is information about your plot/dome. It is crucial you read this so you don't make any mistakes with your dome. (It is the jungle wood dome in the residential area). Thank you for reading, and together we can make the world a safer place for the future generation! And are these domes fully self sufficient, or are they just an alpha? 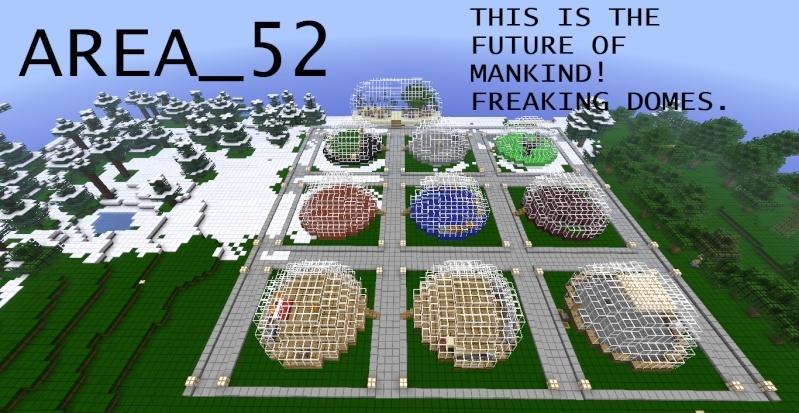 Epic idea mate, I love the idea of domes and being original, Great work! Thanks guys for the support! Means a lot. And Caz to answer your question, the domes are built for the player to keep their bed and items. Everything else, i.e. farms or mines are found elsewhere. However, the player can build a tunnel coming out of their dome into a mine, or a small wheat farm or something outside or inside their dome as long as it is in their plot. Each resident after joining, chooses a place where they want their dome to be built and picks either a material from the information dome or uses their own. That's all there is to it.